You almost knew this one was going to come down to the last shot. 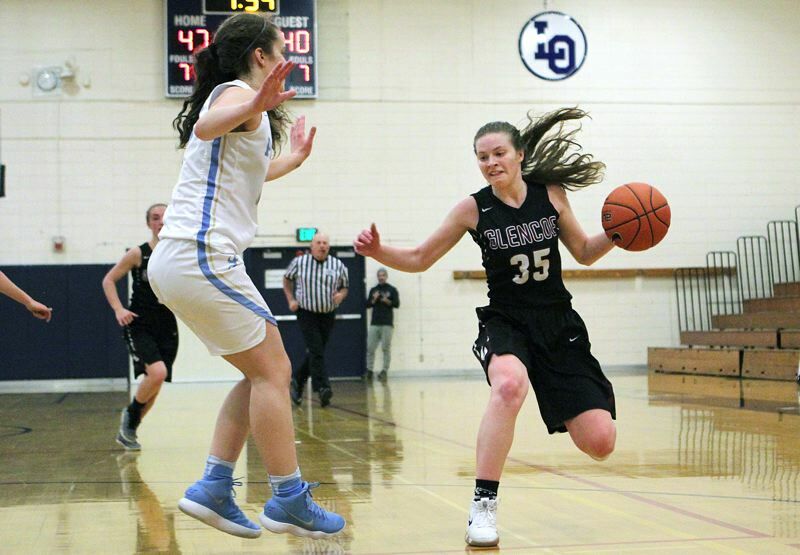 The Lakeridge and Glencoe girls basketball teams, matched up in the first round of the Nike Interstate Shootout at Lake Oswego High School on Dec. 26, took turns grabbing momentum until the very end of the game. There, after Glencoe had erased almost all of the Pacers' 10-point fourth-quarter lead, the Crimson Tide cut its deficit to just three and had possession of the ball with 12 seconds remaining. After seeing the ball knocked out of bounds and re-starting with just seven seconds to go, Glencoe swung the ball to senior guard Breauna Van Dyke just right of the top of the key. She caught the ball and launched a game-tying 3-point attempt just as the final buzzer sounded. Her shot dropped through the hoop, but game officials ruled that time had elapsed before Van Dyke released the ball and the Pacers escaped with a 52-49 victory. "They were letting us have too much so they came out the second half and played much tougher defense and we kind of backed off and took a step back instead of being the aggressor and going at them," said first-year Glencoe coach Kassi Conditt. With the loss, Glencoe saw its two-game winning streak broken and fell to 3-5 overall. The Pacers, meanwhile, snapped a two-game losing streak and improved to 4-2 in non-league play. "We definitely have to play smarter and slow it down when the game is starting to get tight," said Lakeridge sophomore wing Rose Daniels, who finished with 11 points, seven of those in the second half. "We need to slow it down and make smarter passes and take better shots." "I think we were just getting too excited and trying to force too many shots and bad shots turned into fast breaks for them," said Lakeridge sophomore guard Addie Reardon, who scored all 11 of her points in the second half. "Shots we shouldn't take turned into buckets for them so I think next time, we'll just control the game better and finish better." Lakeridge held the upper hand early only, limiting the Tide to just five points in the first quarter, getting baskets from five different players on its end and grabbing a 10-5 lead at the end of the period. Glencoe turned the tide in the second frame, however, using its defense to force Lakeridge turnovers and converting on the fast break for a 17-8 scoring edge in the quarter and a 22-18 lead at the half. Junior guard Maggie Gerber led the way there with all six of her points, while senior Jensen Becker added three more for the Tide. "We had a great second quarter," Conditt said. "We got after it on defense and that led to some breakaway opportunities for us and we passed the ball well in transition." "I feel like we were rushing a lot of passes which definitely was not part of … what we usually do," Daniels said. "We slowed it down a bit after that, but yeah, the second quarter did not go as we thought it would." Glencoe pushed its lead to 26-20 on a Van Dyke foul shot 2:23 into the third quarter, but the Pacers took over after that. Over the next 7:53, Lakeridge outscored the Tide 24-8 to grab what appeared to be a commanding 44-34 edge with 5:44 remaining in the final period. Reardon knocked down one 3-pointer, hit twice more from the field and scored nine points in that stretch, Daniels hit three straight times from the field, freshman guard Reese Ericson hit another "3" and scored five points, and freshman post Kiersten Weiler added four points for the Pacers in that stretch. "We talked about slowing down the game more, eliminating our turnovers and playing our game and not theirs," Reardon said. "I'm sure they had a rough halftime. They probably were told to step up on defense," Conditt added. To their great credit, however, the Tide did not fold. Still down 49-41 after a hanging Ericson jumpshot in the lane with 1:40 to play, Glencoe came back with a foul shot by senior Elizabeth Anderson, a Van Dyke 3-pointer, a pair of free throws by junior guard Mallory Confer, and then, a "3" from senior guard Morgan DeBord assisted by Anderson that cut the deficit to 52-49 with 14 seconds left and set up Van Dyke's final game-tying attempt. For the game, Reardon, Daniels and Ericson led Lakeridge with 11 points each, senior wing Brooke Clinton added nine and Weiler eight. For Glencoe, Confer led all scorers with 16 points — 14 of them in the second half — DeBord added nine and Van Dyke seven.